Blizzard has just announced a new franchise built from the ashes of the failed Titan MMO project, and it’s a Team based Multiplayer Shooter like Team Fortress but with Pixar like graphics called Overwatch. The trailer is just adorable, plus we get a shot of Blizzard’s own Hearthstone somewhere as a bonus. The action of Overwatch takes place in a technologically advanced, highly stylized future earth. 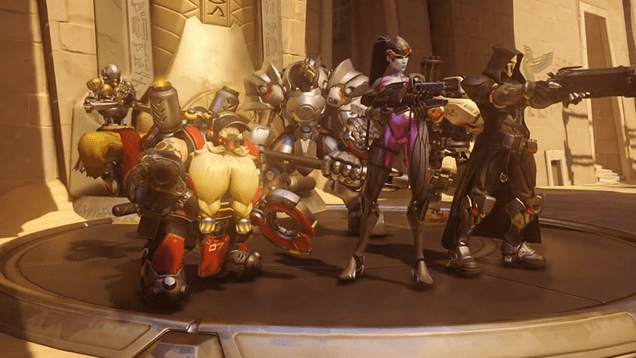 In a time of global crisis, an international task force of soldiers, scientists, adventurers, and oddities known as Overwatch had come together to restore peace to a war-torn world. After many years, the group’s influence waned, and it was eventually disbanded. Overwatch might be gone now . . . but the world still needs heroes. With an emphasis on accessibility and pure fun, Overwatch brings Blizzard’s signature easy-to-learn, hard-to-master gameplay to the FPS genre. Harnessing the power of their hero of choice, players will join forces in teams of six and battle each other across a range of futuristic global locations, from the hologram-lit streets of London to a bazaar in the shadows of a high-tech Egyptian pyramid. Every battlefield is iconic and built to highlight each character’s unique abilities, and fights can shift from streets to rooftops to open skies within the span of a breath. Tracer, a former British test pilot who shrugs at danger, can execute impossible acrobatic assaults thanks to her ability to teleport, drop energy bombs, and even reverse time. Reinhardt, a hulking German soldier in battle armor, can charge great distances and pin his enemies to a wall or slam the ground with his rocket hammer to knock them off their feet. Hanzo, a bow-wielding Japanese mercenary, has the ability to scale walls with his bare hands, fire off a tracking device that illuminates nearby enemies for his team, and unleash a huge spirit dragon that does grievous damage to all enemies in its path. Symmetra, an Indian architech, manipulates light and energy to shield her allies and damage her enemies—and she can turn the tide of any battle by building a device that instantly transports her teammates to the front lines.